Your air conditioning and heating system keeps your Longview, Texas, home comfortable at all times of the day and during every season of the year. However, most thermostats cannot choose the perfect temperature for you. Varying temperature preferences can force you to adjust the thermostat manually throughout the day, which is both inconvenient and inefficient. If you’re feeling frustrated with your current system, you’re not alone. Thankfully, many newer thermostats, including Honeywell digital thermostats, offer setback and programmable functions. When properly installed, these thermostats offer many benefits for Longview, TX, homeowners. Increased comfort: A programmable thermostat allows you to set different temperatures at different times. When your thermostat runs on an automatic schedule, you can set back the temperature while at work and still return to a comfortably cool home. Maximum convenience: A programmable thermostat reduces the amount of time you’ll need to spend adjusting the temperature. Generally, the temperature inside your house will match your preferences without requiring input. If you do need to manually turn on your AC or heating, however, you can do this easily as well, without disrupting scheduled temperature changes. Increased efficiency: Your digital thermostat can help you increase your home’s energy efficiency, even working together with other indoor air quality systems to keep the interior of your home comfortable without wasting power. Cost savings: If you program your thermostat to run only when you’re at home, you could see significant savings in your utility bills. In fact, you could lower your energy costs as much as 10 percent just by turning your thermostat back for eight hours a day. At A/C Contractors, we’re dedicated to helping customers in Longview and Tyler, TX, achieve more comfortable and efficient living spaces. 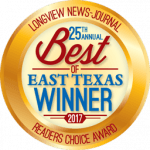 For the past 10 years, we’ve been voted “Best of East Texas” for our great customer service, financing and 100 percent money back satisfaction guarantees, and we’re eager to help you as well. To request our digital thermostat installation services, call the Comfort Kings at 903-759-4250 or reach out to us online today.